MOSCOW, June 21. /TASS/. The mummy a group of archaeologists from St. Petersburg’s Institute for the History of Material Culture has unearthed near the Sayano-Shushenskaya Dam is attributed to the Hunnu culture, the leader of the institute’s archeological expedition to Tuva, Marina Kilunovskaya, has told TASS. "The mummy of a young woman was found inside a grave at the burial ground Terezin on the shore of a water reservoir. The lower part of the body is well-preserved. It is not a classical mummy, though. The grave remained tightly sealed under the stone cover all along. The body underwent natural mummification," Kilunovskaya said, adding that the mummy belonged with the Hunnu era and should be dated back to the 1st century B.C. This is the first grave to have been found in Tuva. Nothing indicates it was rich. 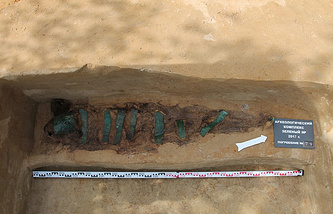 Next to the body the archeologists found some fragments of ceramic utensils and other items characteristic of Hunnu funeral practices. All items will now be thoroughly examined in St. Petersburg. The artifacts picked on the site several hours after the mummy was discovered, such as a belt adorned with bead embroidery, prompted archeologists to conclude that the woman was young and noble. Next to the woman’s head there lay a beach bark-covered wooden box containing a Chinese mirror in a felt case. One of the two vessels retrieved from the grave was a typical Hunnu vase. On the woman’s chest there lay a pouchful of cedar nuts. Some fragments of clothing, presumably made of silk fabric, are in good condition for further analysis. Tuva is an area where many archeological monuments left by different peoples continue to be found. The Arjaan-2 mound contained the grave of a Scythian tsar and a large collection of gold items. The excavation of the old fortress Por-Bazhyn began under the patronage of the Emergencies Ministry in 2007. Hunnu - a nomadic people who at the end of the 3rd century B.C. created a vast state in the territory of what is now northern China and southern Siberia. It is believed that after the collapse of their state part of the Hunnu people migrated westwards to get mixed with locals. In Europe their descendants were known as Huns. 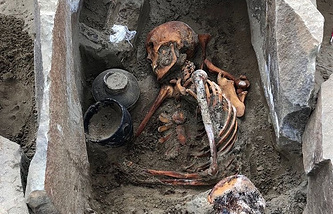 In May 2018, an expedition was dispatched to Tuva to study archeological monuments flooded by a water reservoir that emerged after the construction of the Sayano-Shushenskaya Dam on the Yenisei River (the reservoir began to be filled with water in 1985). Large territories in Tuva, including archeological sites were flooded. The level of water in the reservoir usually falls in May-June, providing temporary access to the flooded historical sites and monuments.